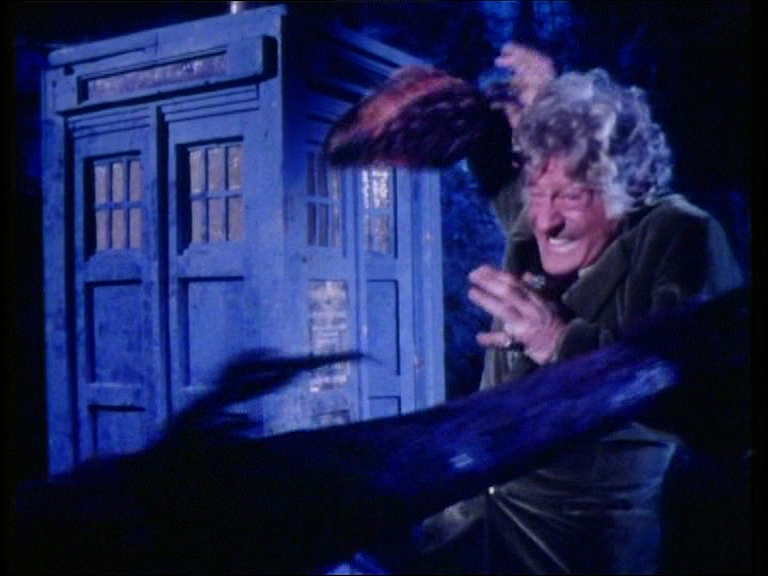 As in 'Curse of Peladon', this is the tentacular riding in on past associations... however, it can't be said to work quite the same way as previous tentacles in the Pertwee era. This tentacle is clearly not obscuring any potential thematic convergence upon the subject of capitalism, as in 'Spearhead from Space' and 'Claws of Axos'. Nor is it standing in for implied capitalism, as in 'Curse of Peladon'. Capitalism is something that 'The Green Death' is aware of openly. It doesn't need to be either obscured or implied... especially since the 'critique' of capitalism the story offers is actually quite diffident, to the extent of dehumanizing the working class. And this tentacle is only a momentarily glimpsed feature of a side-trip, taking place literally light years away from Global Chemicals. However, it's in 'The Green Death' rather than, say, 'The Time Warrior'. It's in a story about an evil corporation rather than one about a feudal warlord. So, the association is still evident and active. There is also a distinct Weird inflection to the maggots. Their multiplicitous tubular wriggliness is hardly a million miles from being tentacular. They have some of that quintessentially Weird incoherence. However, like 'Spearhead from Space', 'The Claws of Axos' and 'Curse of Peladon' before it, 'Green Death' retains a hauntological charge. The maggots themselves are steeped in gothic, in associations to do with death. Real maggots breed in corpses or bad meat. They are of putrefaction. This suggests skulls and bones and graveyards, and it suggests them in the gothic mode: as signalling extremes and transgressions, and the haunting presence of that which has been denied and repressed. Biological corruption is here aesthetically linked with the corruption of the environment by big business. 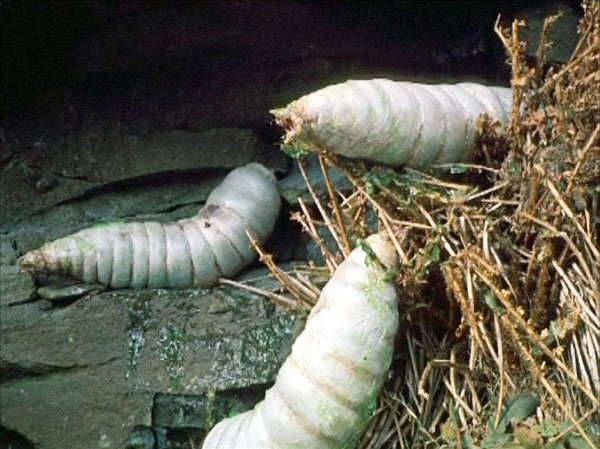 The maggots appear in the mine because they are generated by the toxic waste from the Stevens Process, which is secretly dumped underground. Eventually, they erupt out of the mine into the world above, like zombies out of graves. They make a typical gothic move. They do it almost too literally. They have been repressed and then they return. They have been buried out of sight but wriggle out of their subterranean hiding-place. Moreover, this is gothic very much in the Who mode. It's outward form is non-spectral, material/ist, haunting us with social and political and industrial terrors (i.e. industrial pollution). • Touch and touchability is central. James’s is the horror of the physical universe (a trauma that would trace into the obsessive materiality/-ism of Lovecraft’s horror). It is the cloth-ness of the notorious face ‘of crumpled linen’ in ‘Oh Whistle and I’ll Come to You My Lad’ that makes it so terrible. James even names one of his late stories ‘The Malice of Inanimate Objects’. The touchability of his ‘ghosts’ is not a return to that of their 18th-century cousins: this is a new (Weird) haptos, with little to do with human somaticism, and everything to do with the horror of matter. The most grotesque moment in ‘The Ash Tree’ is the ‘soft plump, like a kitten’, with which a just-glimpsed giant spider drops off the bed. runes occasion is brought down quite amorally on whoever took them last, according to the depersonalised passings-on of bits of paper. The horror is of the universal equivalent in mass commodification: the runes are Bad Money. Most astonishingly, in ‘The Diary of Mr Poynter’, what is haunted is not a scrap of fabric nor the materials with which it is made but the design upon it: it is the copied design, reprinted with explicitly cutting-edge modern techniques, that is the locus for the apparition. This is the work of hauntology in the age of mechanical reproduction. • Most important, of his non-ghost ‘ghosts’, a disproportionate number have appurtenances of the Weird, and read now as startlingly teratologically ahead of their time. His apparitions are hairy (‘The Diary of Mr Poynter’, ‘Canon Alberic’s Scrapbook’), chitinous (‘The Ash-Tree’), slimy and/or amphibious (‘The Treasure of Abbot Thomas’), totally bizarre (‘The Uncommon Prayer-Book’), and more than once, tentacled (‘The Treasure of Abbot Thomas’, ‘Count Magnus’). Now, it seems to me that the giant maggots in 'The Green Death' fit in with this description of James's "adversaries". They may not be "startlingly teratologically ahead of their time" (quite the contrary) but they are - clearly - all about "the horror of matter", "capitalist modernity", "cutting-edge techniques", etc. They are aggressively "bizarre", "slimey" and "chitinous" (never mind that Pertwee doesn't know how to pronounce this word). So, there is an extent to which the gothic and the Weird co-exist in 'The Green Death'. Even the title combines the gothic 'Death' with the slimey, icky, biological 'Green'. If the maggots are (relatively straightforwardly) the dark, gothic secrets of corporate irresponsibility - the 'externalities', the pollutants of corporate power - breaking up out of their post-industrial tomb to haunt us, then they are also quasi-Weirdified. The maggots may, by their very garbled and arbitrary irrelevance, express the horror of the unforseen and unintended effect, the by-product, the runaway process. In any case, there are precedents for hauntological adversaries of this kind - of the Weird, material, slimey, chitinous, capitalist kind - right at the start of the modern ghost story: the material/ist non-ghosts of James. These are, I think, the very kinds of adversaries that 70s Doctor Who summons up when it notices capitalist relations... and this is itself consistent with the Jamesean ghost story. As noted by Miéville, James's ghosts are often linked to or emergent from capitalism. In very much the same way, Doctor Who's material/ist gothic slips into the quasi-Weird when it slides close to an awareness (of a positive or negative kind) of capitalist relations. 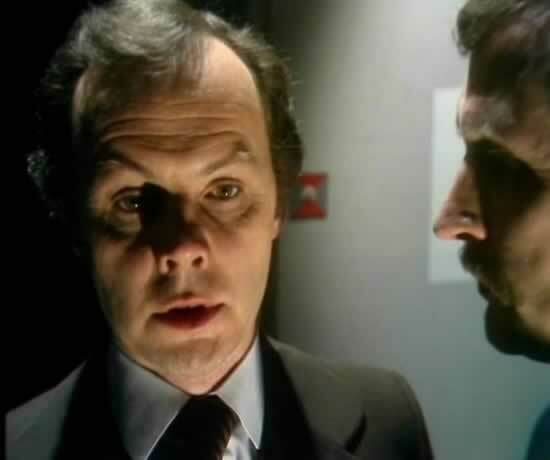 That's why 'The Green Death'... and, indeed, many other Doctor Who stories... could be said to be a ghost story. But, I hear you scream, how can 'The Green Death' be said to be a 'ghost story' when there are no ghosts in it? How can Doctor Who, with its outer shell of pro-Enlightenment bluster (inherited from an original remit to be 'educational'), be said to be a collection of ghost stories, especially when it keeps telling us that "spooks and ghosts" "don't exist"? The answer is: by being more true to the roots of the modern tradition. Stories of ghosts may date from the emergence of stories themselves, but 'ghost stories', in the sense that we usually talk about them today, date from the 19th century. They're quite different to what we see in, say, the Renaissance, when ghosts simply appeared as and when needed in tragedy or comedy. Hamlet is the classic example. It has a ghost in it, but it is not a 'ghost story' in our terms, no more than it is a 'crime thriller' or a 'whodunnit', despite having murders in it. In many ways, the earliest modern 'ghost stories' are far less spectral than Shakespeare's spirits... and far less easily comprehensible. It is in the very physicality and incoherence of the hauntings in 'The Green Death' that we see this. The maggots haunt, but they do it physically and materially. They even do it Weirdly... as did some of the haunting things of M.R. James. Now... a distinction must be made. The classic late-19th century / early-20th century 'haute Weird' was prefigured in James, combined with the hauntological. This, however, is clearly not what's going on in 'The Green Death', which was crafted and broadcast long after the Weird proper had burst onto the scene and then declined. Rather, the Weird or quasi-Weird that we see in 'Green Death' is not the true-Weird but an echo of the Weird, a processed and recalled version if it... a spectre of the Weird, if you like. This is broadly true of all the quasi-weird that surfaces in Doctor Who. This 'Who-Weird' is an ancestral trait from the evolutionary history of monsterology, cropping up in outer form only, like a throwback. This, by the way, illuminates another way in which 'The Green Death' uses a material/ist hauntology: it invokes the concept of atavism. 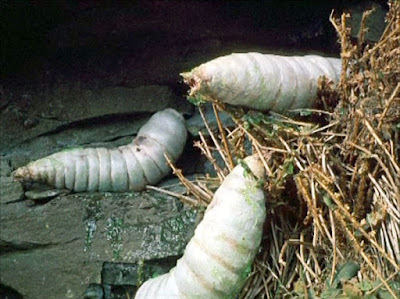 The maggots are said to be "atavistic mutations". Atavism is the reappearance of ancestral traits. Atavism was associated with the concept of the 'throwback' in the sense of the return of primitivism, hence Lombroso and his idea that criminals were 'primitives' walking in the clothes of modern men. Inherent in this was the notion that the modern (i.e. more evolved) man was less likely to be a criminal... but that Man might slip backwards. Progress marches on but inevitably brings the occasional lapse into regress. Indeed, the regress illumines the progress. This idea seems inherent in 'The Green Death'. The whole raison d'etre of Global Chemicals is a bourgeois notion of progress: efficiency and profit. Yet their progress brings also the atavism that produces throwbacks to an age of monsters (actual science aside). If the maggots are atavistic, this makes them the genetic gothic. They are a kind of bio-hauntology. Once again, they are ghosts in slimey, hairy, wriggling, chitinous form. It's interesting, in light of all this, that there is a character in 'The Green Death' called 'Mr James'.